The Feast of Tabernacles is the glorious Marriage Supper of the Lamb. God’s angels gather up His elect from the four winds and take them to heaven at Jesus’ Second Coming. This is the last teaching in the series of Messiah’s Calendar. We’ve been on a glorious journey through the seven feasts of the Hebrew religious calendar. Today we’ll be studying the last feast, called the Feast of Tabernacles, also known as the Feast of Ingathering. For those of you joining us for the first time, after listening to this study I encourage you to listen to the other programs in the Messiah’s Calendar series so that you’ll learn about the important role of the ancient Hebrew Sanctuary in God’s Plan of Redemption. I’d like to remind you that you can go to our website at https://citybiblegroup.com and submit your questions or comments there. You can also email them to me at info@citybiblegroup.com . I’d love to hear from you! We’re giving away a free copy of the “Top 10 Countdown of Myths in the Church” to any of you who subscribe to our free newsletter. We’re happy to mail it to you free of charge in book or CD format or you can also download it in e-book format. All you need to do is sign up for the newsletter. The Feast of Tabernacles was first given by the Lord to the children of Israel in Leviticus 23:33-36 and then again in Leviticus 23:39-43. The Feast of Tabernacles is celebrated on the fifteenth day of the seventh month. The seventh month was the last month of the religious calendar. It started with the Feast of Trumpets on the first day of the seventh month to announce the coming judgment, then the Day of Atonement took place on the tenth day of that month. Five days later on the fifteenth day of that last month was the beginning of the Feast of Tabernacles. It started with a Sabbath-rest and for seven days the children of Israel would dwell in booths. On the eighth day would be another Sabbath-rest and a great feast. “Also on the fifteenth day of the seventh month, when you have gathered in the fruit of the land, you shall keep the feast of the Lord for seven days; on the first day there shall be a Sabbath-rest, and on the eighth day a Sabbath-rest. And you shall take for yourselves on the first day the fruit of beautiful trees, branches of palm trees, the boughs of leafy trees, and willows of the brook; and you shall rejoice before the Lord your God for seven days. You shall keep it as a feast to the Lord for seven days in the year. It shall be a statute forever in your generations. You shall celebrate it in the seventh month. You shall dwell in booths for seven days. All who are native Israelites shall dwell in booths, that your generations may know that I made the children of Israel dwell in booths when I brought them out of the land of Egypt: I am the Lord your God” (Leviticus 23:39-43). The Feast of Tabernacles is a happy feast. It both looked back to the goodness of the Lord for His deliverance, and it looked forward to the fatness and the bounty of the Promised Land that Israel was to inherit. The Feast of Tabernacles is also known as the Feast of Ingathering, because this was the season of the second harvest of the year, the fruit harvest: grapes, olives, dates and pomegranates. Another name for the Feast of Tabernacles is the Feast of Booths. If you think back to the very beginning of the Jewish people in the Book of Genesis, the early patriarchs starting with Abraham dwelt in tents. Abraham lived in tents, Isaac lived in tents, and Jacob who would be renamed Israel lived in tents. When God working through Moses delivered the children of Israel, they also dwelt in tents in the wilderness until they reached the Promised Land. Remember how the Lord guided Israel through the wilderness by a cloud by day and a pillar of fire by night? This is described in Numbers 9:17-23. When the cloud moved the children of Israel would pick up their tents and move, following the cloud. When the cloud stopped they would pitch their tents and encamp until the cloud moved again. It’s such a beautiful passage; we won’t have time to read it today, I’ll just read you the last verse: “At the command of the Lord they remained encamped, and at the command of the Lord they journeyed; they kept the charge of the Lord, at the command of the Lord by the hand of Moses” (Numbers 9:23). This is really talking about obedience: it’s talking about a people who walked with their God. For the people of Israel living in tents evoked deliverance and a going back to their roots. It also signified a tight walk with their God, basking in His goodness and protection. Remember all the blessings promised in Deuteronomy 28 to those who obey. The prophet Isaiah summed it up like this: “If you are willing and obedient, you shall eat the good of the land” (Isaiah 1:19). As they walked in obedience their land yielded abundant harvests. The children of Israel were to build the tents from the branches of palm trees and the boughs of leafy trees that they would bring from the woods. All the males 12 and over had to come to Jerusalem for this feast to present themselves before the Lord. When the booths were set up in the city of Jerusalem the city looked like a beautiful forest! It was a real feast with wonderful fruit to eat from the harvest. Why were the children of Israel rejoicing? There are two more elements of the Feast of Tabernacles that I need to mention very quickly. We won’t have time for a lot of detail, but let’s just be aware of these two elements, because they’ll both play a prominent role in the New Jerusalem, the City of God. The first one was light. All night every night the temple courtyard was ablaze with artificial light, which really impressed upon the people that this was a grand feast. The light symbolized the pillar of fire with which the Lord gave light and warmth to Israel in the wilderness. The second element was water. There was also a water ceremony during the feast. The priest would take a flagon and fill it with water from the Kedron River. Then he would take the flagon up to the altar where there were two silver basins. The priest would pour the water into one basin and wine into the other. The contents of the two basins then mingled as they flowed into a pipe that poured into the river and ultimately into the Dead Sea. The water was to remind Israel of how the Lord had brought water out of a rock to quench their thirst when they were crossing the desert. For His mercy endures forever. Then the king and all the people offered sacrifices before the Lord” (2 Chronicles 7: 1-4). “At that time Solomon kept the feast seven days, and all Israel with him, a very great assembly from the entrance of Hamath to the Brook of Egypt. And on the eighth day they held a sacred assembly, for they observed the dedication of the altar seven days, and the feast seven days. On the twenty-third day of the seventh month he sent the people away to their tents, joyful and glad of heart for the good that the Lord had done for David, for Solomon, and for His people Israel. Thus Solomon finished the house of the Lord and the king’s house; and Solomon successfully accomplished all that came into his heart to make in the house of the Lord and in his own house” (2 Chronicles 7: 8-11). What’s very significant about this passage we just read is that permanence in the dwelling place of the Lord. King David and his son Salomon built a mighty temple so that the Lord Himself would no longer have to dwell in a tent. In Exodus 25:8 the Lord had said to Moses: “And let them make Me a sanctuary, that I may dwell among them”. In the days of ancient Israel the Sanctuary was a portable tent that traveled with them during their conquest of the Promised Land. They would take the Ark of the Covenant with them into battle so that the Lord would give them the victory. The Lord travelled with His people in utter love and simplicity. But now, after giving King David peace from his enemies round about, the Lord was established in a beautiful temple in the midst of the beautiful city of Jerusalem, to dwell with His people forever. It’s this permanence of dwelling in the presence of the Lord that we’re looking forward to in the anti-type or the fulfillment of the Feast of Tabernacles. When Jesus comes back to get us we shall forever be with the Lord. Sadly, the Bible story tells us that not long after the children of Israel came to the Promised Land they fell into apostasy. They neglected the Law of Moses and the keeping of the Sanctuary feasts. When the apostasy – apostasy means the falling away from the ways of the Lord – had reached its climax the Lord punished them with the Babylonian invasion and the Babylonian captivity. The Temple of Jerusalem built by Salomon was destroyed and its treasures together with the children of Israel were taken to Babylon as spoils of war. The Feast of Tabernacles only began to be kept again in the days of Nehemiah, upon their return back to Jerusalem from the captivity. We’ll read one last scripture pertaining to the type of the Feast of Tabernacles, from the Book of Nehemiah. My eyes tear up as I read this chapter of the Book of Nehemiah! I just want you to appreciate what’s going on. The children of Israel were only now rediscovering the Book of the Law of Moses after decades of rebellion and disobedience. Nehemiah was the governor of Jerusalem who rebuilt the wall. Nehemiah had gathered the people together in the city. Ezra the high priest and scribe was standing above the people, reading the Book of the Law to the people. It was the seventh month after their return to Jerusalem from the Babylonian captivity. The people were weeping and worshipping the Lord on their faces. And Ezra read to them from the Book concerning the Feast of Tabernacles. And all the people wept when they heard the words of the Law. “Then the people went out and brought them and made themselves booths, each one on the roof of his house, or in their courtyards or the courts of the house of God, and in the open square of the Water Gate and in the open square of the Gate of Ephraim. So the whole assembly of those who had returned from the captivity made booths and sat under the booths; for since the days of Joshua the son of Nun until that day the children of Israel had not done so. And there was very great gladness. Also day by day, from the first day until the last day, he read from the Book of the Law of God. And they kept the feast seven days; and on the eighth day there was a sacred assembly, according to the prescribed manner” (Nehemiah 8:14-18). So once again in the history of Israel the Feast of Tabernacles becomes deeply imbued with the meaning of coming out of captivity, being reconciled and at peace with their God, and rejoicing in the goodness and forgiveness of the Lord. Now we’re ready to start making some connections to the anti-type of the Feast of Tabernacles, to the higher reality that it pointed forward to. We’ll start in the Book of Hebrews Chapter 11, the faith chapter. Abraham, Isaac and Jacob knew that they were strangers on the earth and were looking forward to a permanent home, a city whose builder and maker is God. Let’s read: “By faith Abraham obeyed when he was called to go out to the place which he would receive as an inheritance. And he went out, not knowing where he was going. By faith he dwelt in the land of promise as in a foreign country, dwelling in tents with Isaac and Jacob, the heirs with him of the same promise; for he waited for the city which has foundations, whose builder and maker is God” (Hebrews 11:8-10). Let’s jump to verse 13: “These all died in faith, not having received the promises, but having seen them afar off were assured of them, and embraced them and confessed that they were strangers and pilgrims on the earth. For those who say such things declare plainly that they seek a homeland. And truly if they had called to mind that country from which they had come out, they would have had opportunity to return. But now they desire a better, that is, a heavenly country. Therefore God is not ashamed to be called their God, for He has prepared a city for them” (Hebrews 11:13-16). So the Apostle Paul is laying out an analogy between the temporary dwelling in tents and being pilgrims and strangers on the earth. In the same way that those who dwelt in tents were waiting to come into their Promised Land, those who dwell on the earth are waiting to come into their Promised Land, the New Jerusalem, the city of God, that He has prepared for those who love Him. I want you to notice something else that the Apostle Paul does in verse 10. Referring to Abraham he says: “For he waited for the city which has foundations, whose builder and maker is God” (Hebrews 11:10). We have to go now all the way to Revelation 21, the next to last chapter in the Bible, to see that Paul is connecting Old and New Testament, Jewish dispensation and Christian dispensation, the twelve tribes of Israel and the twelve disciples of Christ. These all come together in the Revelation and in the New Jerusalem. Remember that in the Revelation, all of the books of the Bible meet and end. Let’s read part of the description of the New Jerusalem, the city of God, to find out what are the foundations of the city that Paul is referring to. “And he carried me away in the Spirit to a great and high mountain, and showed me the great city, the holy Jerusalem, descending out of heaven from God, having the glory of God. Her light was like a most precious stone, like a jasper stone, clear as crystal. Also she had a great and high wall with twelve gates, and twelve angels at the gates, and names written on them, which are the names of the twelve tribes of the children of Israel: three gates on the east, three gates on the north, three gates on the south, and three gates on the west. Now the wall of the city had twelve foundations, and on them were the names of the twelve apostles of the Lamb” (Revelation 21:10-14). So the city of God will be home to all of us throughout the ages who have walked with God and have our names written in the Lamb’s Book of Life. That’s the symbolic meaning of this verse in Leviticus 23 that we read earlier, you probably didn’t pick up on this: “All who are native Israelites shall dwell in booths” (Leviticus 23:42). In other words, only those who are native Israelites will take part in the Feast of tabernacles. The Feast of Tabernacles is the crossing of the Jordan by spiritual Israel into our heavenly Promised Land. Spiritual Israel is the seed of Abraham – not the literal descendance of Abraham but those who are in Christ. “And if you are Christ’s, then you are Abraham’s seed, and heirs according to the promise” (Galatians 3:29). And who hasn’t heard these beautiful words spoken by Jesus: “Let not your heart be troubled: ye believe in God, believe also in me. In my Father’s house are many mansions: if it were not so, I would have told you. I go to prepare a place for you. And if I go and prepare a place for you, I will come again, and receive you unto myself; that where I am, there ye may be also” (John 14:1-3). When Jesus comes to gather up His people we will travel with Him to heaven seven days, and on the eighth day when we get to Heaven will be the glorious marriage supper of the Lamb. This is what Ellen White, the prophet of God, wrote in Early Writings regarding the prophetic fulfillment, the anti-type of the Feast of Tabernacles: “We all entered the cloud together, and were seven days ascending to the sea of glass, when Jesus brought the crowns, and with His own right hand placed them on our heads. He gave us harps of gold and palms of victory” (Early Writings page 16). John the Revelator describes it like this: “After these things I looked, and behold, a great multitude which no one could number, of all nations, tribes, peoples, and tongues, standing before the throne and before the Lamb, clothed with white robes, with palm branches in their hands, and crying out with a loud voice, saying, “Salvation belongs to our God who sits on the throne, and to the Lamb!” (Revelation 7:9-10). “And I said to him, “Sir, you know.” So he said to me, “These are the ones who come out of the great tribulation, and washed their robes and made them white in the blood of the Lamb. Therefore they are before the throne of God, and serve Him day and night in His temple. And He who sits on the throne will dwell among them. They shall neither hunger anymore nor thirst anymore; the sun shall not strike them, nor any heat; for the Lamb who is in the midst of the throne will shepherd them and lead them to living fountains of waters. And God will wipe away every tear from their eyes” (Revelation 7:14-17). So God’s saints are delivered out of a great tribulation, which they’ll need to endure with patience and faith. We were just in heaven with John the Revelator, delighting ourselves in the company of heavenly beings. But to fully appreciate the magnitude of the deliverance of God’s people and the intensity of the rejoicing during the Feast of Tabernacles, we need to understand what was going on in the Earth immediately leading up to Jesus’ Second Coming. We read in Revelation 13 how the beast – the anti-christ – had his wound completely healed. Who’s the anti-christ? If you’re listening to us for the first time and you don’t know who the anti-christ is, please listen to some of our early programs, especially “The Mark of the Beast” and “Saturday vs. Sunday”. In those studies I provide all of the biblical evidence as to the identity of the beast. The short answer is that the anti-christ is not an individual, but a role, a system. That system is the Roman Catholic papacy. It’s the only system that meets all of the descriptors of the anti-christ given in Daniel 7, Revelation 13 and Revelation 17. Let’s go to Revelation 13 to discover what’s happening on earth shortly before Jesus comes. This verse is talking about the beast or the papacy: “The dragon (referring to Satan) gave him his power, his throne, and great authority. And I saw one of his heads as if it had been mortally wounded, and his deadly wound was healed. And all the world marveled and followed the beast. So they worshiped the dragon who gave authority to the beast; and they worshiped the beast, saying, “Who is like the beast? Who is able to make war with him?” (Revelation 13:2-4). So Satan gave the papacy its power, throne and great authority. How much authority? Let’s continue reading from Revelation 13: 6-8: “Then he (the anti-christ) opened his mouth in blasphemy against God, to blaspheme His name, His tabernacle, and those who dwell in heaven. It was granted to him to make war with the saints and to overcome them. And authority was given him over every tribe, tongue, and nation. All who dwell on the earth will worship him, whose names have not been written in the Book of Life of the Lamb slain from the foundation of the world”. Satan is the prince of this world who was cast out at Calvary yet refuses to yield the dominion of this world back to Jesus. Satan gives the anti-christ authority over every tribe, tongue, and nation. In today’s language we’d call this global power. The anti-christ uses his power to wage war against God’s people – as he did during the Middle Ages before he received the deadly wound in 1798. The pope will unleash massive persecution against God’s commandment-keeping people because we refuse to worship the dragon on the day of the dragon. Sunday is the day of the dragon. What does it mean to worship the dragon or the beast? It means to worship on Sunday. Sunday is the day of the dragon. Those who worship God, the Creator, worship Him on the Sabbath as instructed in the fourth commandment. Those who worship the papacy worship on Sunday. This includes Protestants who have accepted the authority of the Catholic Church in this matter and keep Sunday instead of the Sabbath. To sum it up: the final great showdown in the battle between Jesus and Satan is over worship. Which day you worship will be the sign of whose authority you obey. If you worship on Sunday you’ll receive the mark of the beast, the sign of the Roman Catholic Church’s ecclesiastical authority. If you worship on the Sabbath you’ll receive the seal of God, and your name will be confirmed in the Lamb’s Book of Life. The persecution intensifies. God’s people cannot buy or sell because they refuse the mark of the beast. Those who persist in worshipping on the Sabbath are taken to tribunals and courts of law, just like Jesus was before His crucifixion. They’ll need to defend their faith before men. Ultimately, the Bible tells us that there will be a death decree proclaimed against God’s people, just as there was against Jesus. Let’s read another few verses from Revelation 13: “He (the land beast, which represents the US) was granted power to give breath to the image of the beast, that the image of the beast should both speak and cause as many as would not worship the image of the beast to be killed. He causes all, both small and great, rich and poor, free and slave, to receive a mark on their right hand or on their foreheads, and that no one may buy or sell except one who has the mark or the name of the beast, or the number of his name” (Revelation 13:15-17). What this verse is telling us in coded language is that the US will form an image to the Roman beast by uniting church and state, Vatican-style. The Pope is head of both the Church and the Holy See. Through the union of church and state the Roman papacy will recover its political power and extend its authority over the whole world. That will lead to God’s people losing all their assets and their ability to buy and sell. A death decree will be signed against them and they flee to isolated places to escape. This is why Jesus said “And pray that your flight may not be in winter or on the Sabbath” (Matthew 24:20). Things get pretty rough for God’s people. They lose everything for Christ. Why will God allow God’s people to go through such terrible trials? We find the answer in Daniel 12:10: “Many shall be purified, made white, and refined”. We’ll be refined in the furnace of affliction. We need to be willing to give everything up for Jesus. “Whoever seeks to save his life will lose it, and whoever loses his life will preserve it” (Luke 17:33). Finally, when the death decree is passed, Michael stands up: “At that time Michael shall stand up, the great prince who stands watch over the sons of your people; and there shall be a time of trouble, such as never was since there was a nation, even to that time. And at that time your people shall be delivered, every one who is found written in the book” (Daniel 12:1). “He who is unjust, let him be unjust still; he who is filthy, let him be filthy still; he who is righteous, let him be righteous still; he who is holy, let him be holy still. And behold, I am coming quickly, and My reward is with Me, to give to every one according to his work”. So Jesus Himself is telling us that before His coming the doors of grace will close and there will be no more time to repent. When intercession ceases in heaven it means that the judgment of God’s people is finished. The saved are those whose names are written in the Lamb’s Book of Life. Only the saved are coming back to heaven with Jesus. When that judgment in heaven closes there’s no more opportunity to be saved. That takes place before Jesus comes. Once Jesus comes, it’s too late to repent. Right after Michael stands up and leaves the Sanctuary, the last seven plagues start to fall. “And out of the temple came the seven angels having the seven plagues, clothed in pure bright linen, and having their chests girded with golden bands. Then one of the four living creatures gave to the seven angels seven golden bowls full of the wrath of God who lives forever and ever. The temple was filled with smoke from the glory of God and from His power, and no one was able to enter the temple till the seven plagues of the seven angels were completed” (Revelation 15:6-8). Jesus knows the hearts of wicked men are hardened and impenitent. They did not receive the love of the truth that they might be saved (2 Thessalonians 2:10). “For He is coming, for He is coming to judge the earth. He shall judge the world with righteousness, and the peoples with His truth” (Psalm 96:13). Sadly many Christians will be lost who rejected the Sabbath truth and sided with the papacy for the sake of tradition. When the seven last plagues are poured out upon the wicked God’s people are protected and won’t be hurt, like the children of Israel in Goshen during the Egyptian plagues. Many of the wicked will die during the plagues. Those that remain alive at the Second Coming of Jesus will be utterly destroyed and their carcasses will be strewn upon the earth. “Immediately after the tribulation of those days the sun will be darkened, and the moon will not give its light; the stars will fall from heaven, and the powers of the heavens will be shaken. Then the sign of the Son of Man will appear in heaven, and then all the tribes of the earth will mourn, and they will see the Son of Man coming on the clouds of heaven with power and great glory” (Matthew 24:29-30). “And then the lawless one will be revealed, whom the Lord will consume with the breath of His mouth and destroy with the brightness of His coming” (2 Thessalonians 2:8). Jesus performs four roles during His ministry: First, He was the blameless Lamb slain from the foundation of the world. Second, He officiates as High Priest, interceding for His people. Third, as Judge He judges the righteous and selects whom He’ll bring to heaven with Him. Fourth, He’s King of Kings and Lord of Lords, and comes back to earth to reclaim His territory and His subjects. At the Second Coming, we see Jesus fulfilling two roles:s Judge and King. “Then I looked, and behold, a white cloud, and on the cloud sat One like the Son of Man, having on His head a golden crown, and in His hand a sharp sickle. And another angel came out of the temple, crying with a loud voice to Him who sat on the cloud, “Thrust in Your sickle and reap, for the time has come for You to reap, for the harvest of the earth is ripe.” So He who sat on the cloud thrust in His sickle on the earth, and the earth was reaped” (Revelation 14:14-16). “Then another angel came out of the temple which is in heaven, he also having a sharp sickle. And another angel came out from the altar, who had power over fire, and he cried with a loud cry to him who had the sharp sickle, saying, “Thrust in your sharp sickle and gather the clusters of the vine of the earth, for her grapes are fully ripe.” So the angel thrust his sickle into the earth and gathered the vine of the earth, and threw it into the great winepress of the wrath of God. And the winepress was trampled outside the city, and blood came out of the winepress…” (Revelation 14:17-20). 2) Revelation 19:11-16 describes Jesus coming to earth as a conquering King who triumphs over the dragon, the beast and the false prophet. “Now I saw heaven opened, and behold, a white horse. And He who sat on him was called Faithful and True, and in righteousness He judges and makes war. His eyes were like a flame of fire, and on His head were many crowns. He had a name written that no one knew except Himself. He was clothed with a robe dipped in blood, and His name is called The Word of God. 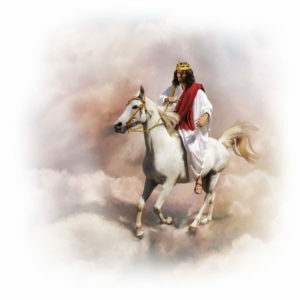 And the armies in heaven, clothed in fine linen, white and clean, followed Him on white horses. Now out of His mouth goes a sharp sword, that with it He should strike the nations. And He Himself will rule them with a rod of iron. He Himself treads the winepress of the fierceness and wrath of Almighty God. And He has on His robe and on His thigh a name written: KING OF KINGS AND LORD OF LORDS”. “Then I saw an angel standing in the sun; and he cried with a loud voice, saying to all the birds that fly in the midst of heaven, “Come and gather together for the supper of the great God, that you may eat the flesh of kings, the flesh of captains, the flesh of mighty men, the flesh of horses and of those who sit on them, and the flesh of all people, free and slave, both small and great (Revelation 19:17-18). “And He will send His angels with a great sound of a trumpet, and they will gather together His elect from the four winds, from one end of heaven to the other. (Matthew 24: 31). All of these tumultuous events are the backdrop for the Feast of Tabernacles. God’s people travel with Jesus seven days to heaven. On the eighth day will be the glorious Marriage Supper of the Lamb. This final passage describes the Holy City, the New Jerusalem. Here we find again the two elements we discussed earlier that were key in the Feast of Tabernacles, fire and water. “And I heard, as it were, the voice of a great multitude, as the sound of many waters and as the sound of mighty thunderings, saying, “Alleluia! For the Lord God Omnipotent reigns! Let us be glad and rejoice and give Him glory, for the marriage of the Lamb has come, and His wife has made herself ready.” And to her it was granted to be arrayed in fine linen, clean and bright, for the fine linen is the righteous acts of the saints. Then he said to me, “Write: ‘Blessed are those who are called to the marriage supper of the Lamb!’” And he said to me, “These are the true sayings of God” (Revelation 19:6-9). “Come, I will show you the bride, the Lamb’s wife.” And he carried me away in the Spirit to a great and high mountain, and showed me the great city, the holy Jerusalem, descending out of heaven from God, having the glory of God. Her light was like a most precious stone, like a jasper stone, clear as crystal. (Revelation 21:9-11). “But I saw no temple in it, for the Lord God Almighty and the Lamb are its temple. The city had no need of the sun or of the moon to shine in it, for the glory of God illuminated it. The Lamb is its light. And the nations of those who are saved shall walk in its light, and the kings of the earth bring their glory and honor into it. Its gates shall not be shut at all by day (there shall be no night there). And they shall bring the glory and the honor of the nations into it. But there shall by no means enter it anything that defiles, or causes an abomination or a lie, but only those who are written in the Lamb’s Book of Life (Revelation 21:22-27). “And he showed me a pure river of water of life, clear as crystal, proceeding from the throne of God and of the Lamb. In the middle of its street, and on either side of the river, was the tree of life, which bore twelve fruits, each tree yielding its fruit every month. The leaves of the tree were for the healing of the nations. And there shall be no more curse, but the throne of God and of the Lamb shall be in it, and His servants shall serve Him. They shall see His face, and His name shall be on their foreheads. There shall be no night there: They need no lamp nor light of the sun, for the Lord God gives them light. And they shall reign forever and ever” (Revelation 22:1-5). Tagged antichrist, antitype, archangel, Bible, book, booths, bride, calendar, city, coming, dragon, feast, feasts, God, gods, great, harvest, Hebrew, ingathering, Israel, jerusalem, Jesus, king, lamb, marriage, michael, nehemiah, new, of, papacy, plagues, plan, Pope, redemption, Revelation, sanctuary, second, solomon, supper, tabernacles, the, tribulation, type, winepress. The study is wonderful, I wish you were here in my area of Provo Utah. I’m searching for a church and haven’t found one close enough to attend yet So I am VERY Thankful for your ministry. I would like to point out an ERROR with Love. Below you say “the Jewish people”, They were NOT JEW’s, THEY were HEBREWS, ISRAELITE’S. Jews were ONE Tribe of the 12 and Moses was a Levite. Abraham never ever knew a Jew. Jacob’s name wasn’t changed to ISRAEL till after Joseph was born and before Benjemine’s birth. Thank you for your comment. Yes, you’re absolutely right. I used the term “Jewish people” loosely, which indeed comes from the tribe of Judah, the southern kingdom. This name probably stuck because the northern tribes (the kingdom of Israel) were almost completely scattered as a result of all their backsliding and apostasy. Indeed, the Feast of Tabernacles, Sukkot in Hebrew, goes by two other names: Feast of Booths and Feast of Ingathering.